Keyword tags are used for two very different purposes and how many you use depends on that purpose. 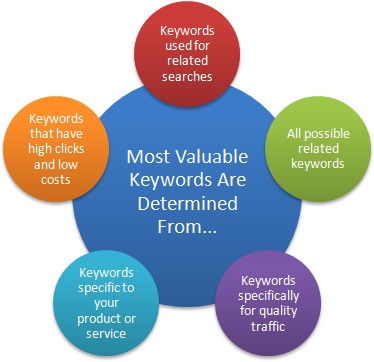 Most of what you read will be related to selecting keywords for SEO or Pay Per Click (ppc) purposes. If you use two words, each word is worth 50% in that algorithm (equation). If you use four words each word is worth 25%; 10 words = 10% and so on. If someone searches for affiliate marketing and you have targeted that exact phrase with 2 words your site is 100% for that part of the equation. If you used four words and their search hits on two of them your site is at 50% for that part of the equation and all sites at greater than 50% will be ranked above yours (for that one factor – yes there are other factors but this one is very important). If your page uses 10 keywords you are only at 20% – more than that even less. I know that many advise using lots of keywords. Either they don’t understand simple math or they are intentionally misleading others to make their own ranking efforts easier to attain. I personally know many top SEOs and have listened to them discuss getting top rankings for really tough industries like mortgages and insurance. I guarantee you they always target only ONE phrase of 2-3 words per page. They just don’t admit publicly how they do it. Tags used for other purposes are different. On Social Networking sites you want to use as many relevant phrases as each site allows. They aren’t calculating percentages for search rankings. They are using them to decide how many different places to put your content. For WordPress tags and most Social Media purposes More Tags = more opportunities for visibility. Note that you have to know what a site is doing with the keywords to know whether to use one phrase or multiple phrases. If they are searching and ranking the way search engines do, use the most important 2-3 word phrase only. If a site uses keyword phrases to put what you share in multiple locations the way StumbleUpon or Delicious does then use many phrases. You can either test to see which works best on each site or decide what is more important to you: maximum laser-targeted traffic or more less targeted traffic. Here is a real life example so you can be really clear on the difference between the various uses for what are called keywords, keyword tags, meta tags or simply tags. I just wrote a post about Deadhead Sinker Cypress for Good Millwork.Notice that I used the phrase Deadhead Sinker Cypress as my anchor text in that link and that is the primary phrase I’m targeting for SEO for that post. When I run pay per click ads to that page I will target multiple similar phrases because there are many different ways someone would search for that type of wood. When I selected the WordPress Post Tags for that post those tags are totally different than the Keywords aka Meta Keywords aka Tags I entered in the SEO field in their blog or the keywords I selected for their AdWords ads. If this were a WordPress.com hosted site instead of a self-hosted blog, the Post Tags would decide who at WordPress will see that post. For these tags we want to think very broadly about who we want to reach. For that post I chose the tags for architecture, construction, green building, Leadership in Energy and Environmental Design, Lumber and specialty woods. Anyone interested in construction, architects drawing up plans, builders interested in green building or LEEDs and those searching for lumber or specialty woods would all be a good target audience for that post. None of them are likely to be searching for Deadhead Sinker Cypress right now and it is unlikely that there is a WordPress category that is so narrowly defined. The point of Post Tags is to show your posts in the categories where the target audience for that post is likely to see them. NOTE: WordPress global tags pages only display the blog posts that are hosted on WordPress.com and NOT self-hosted blogs. Even though posts on self-hosted WordPress blogs do not appear in the WordPress global tags pages, those tags are still important because search engines and sites like Technorati crawl your blog and use those anchor-text links to categorize and index your content. While researching links for this post it became very obvious that not everyone agrees with me about the best uses for tags and categories. Some excellent bloggers and I have different points of view and in the end some decisions are personal perference. I mention this now because I want all my readers to remember to make their own decisions about what they feel is best for their own blog or Web site. There is always a pro or con to how we decide to do things as those who are following the KeywordLuv CommentLuv dofollow debate have seen. In the end each of us must decide where are priorities lie, who we are, and what is most important to us. These two other posts are particularly useful for Understanding Anchor Text and Selecting Keywords First to Make Your Content Easier to Find. NOTE: Many posts below mention an Ultimate Tag Warrior Plugin. It is no longer supported and since tagging has been incorporated into WordPress a plugin for that function is no longer necessary. We should always know how to use meta tags properly. I always put relevant keywords in my site’s meta tags and I never had any problem. Very nice post ,it will help me in SEO thanks …. This is a good point, but from my experience Google does not give any credit to meta tags? Was I understanding this post correctly? That’s what they claim, but some of what they say is disinformation and I’m not an SEO specialist. The way I look at it, using them has no downside and it has an upside – at least in the other search engines – so it just makes sense to use them. Interesting read, we are working on our own social and seo strategy at present and have discussed these issues. How do you feel the google +1 button will alter things? I think when you creating Page Title there should be max 3 keywords that are being focused. You can use keywords of max 255 chars long. Description should be max 155 to 163 chars long. Keywords meta tags are said to be ignored by Google, but these still serve as a nice way of providing easy navigation for your blog posts. As you have said, it does help improve SEO as well. Well, most internet marketers don’t know the important of tags. And I also don’t even know how heavy it is.. I think it is a bit easy to say that Google’s algorithm works like this. It kind of sounds like if I put a page full with the keyword I want to rank for then I will be number one in google. Or if I’m number 2 and number 1 has 5% more of the keyword in his content, then I will be number 1 when I get 6% more. For the rest a great article about keywords and tags! The keyword matching percentage is only one factor of hundreds in the Google algorithm; however, there are few more important than focusing on one two to three word phrase for anchor text and link building. See a related post on for more details. as i observed for every article it works nice when using at least 3-word phrase but above 4 words, the tag looks unaesthetic. Remember that the longer the phrase the less likely there will be any volume of people searching for it so two to three words is best. WordPress Tag is very powerful not only for blog visibility on web but also for its SEO. I would love to hear more about that. Have you written a post you could share the link to or would you be interested in writing about that? Even I am unclear how WordPress tags are used in self-hosted blogs. This is an excellent post covering some basics of SEO. Although I am not an SEO expert but I like the meta tag explanation and I am sure many bloggars will benefit from it. Thanks for sharing it dude. Thank you, Thank you!!! This is great information, I had thought I needed to try and have keywords for each topic we have written about. I couldn’t understand why we never ranked for “Colorado News” in google searches for the Mountain Weekly News. Will report back on the findings!! You’re welcome, Mike. Every time I see yet another tool or person recommending 100 keywords in the meta tags or insisting keyword meta tags don’t even matter any more I think of all the people who will believe them and suffer for it. 1) Select the keyw0rd phrase you want to target first. Read my post on how to figure out what keywords to use – basically – what would someone type in a search engine to find you. 2) Make each page about that keyword phrase and usually ONLY about that phrase. 3) Use that phrase effectively. See my post on how to use keyword phrases. 4) Obtain incoming links using that phrase to that specific page of your site. The best incoming links are on sites with content related to yours and in the body of posts or text. To rank for Colorado News you want incoming links where the link itself is Colorado News < < just like that. If you want your home page to rank for that phrase you want the link to go to that page. Build links to other internal pages using a different keyword phrase. Be creative. You could get links from blogs about photography to your photography sunset post. You can get links from music blogs to your Music Festivals post. Check out my post about geo-targeted niche blogs because your blog is doing what I recommended. That post may give you some good ideas on how to benefit local businesses and create a good income for you. At blog level, keyword density listing in Google Webmaster Tools is very important. So we don’t need to have a very large keyword density on our pages? In your opinion, how much per cent is the best keyword density on a page? This post really isn’t about keyword density – it is more about how to use keywords effectively. Since I do not measure that metric myself I am not the most qualified to answer your question. Read Ron Cripp’s post Understanding Keyword Density. I believe the best way for on page SEO is the actual structure of the page with keyword density, title, and bolding, italicizing, and underlining keywords. I agree,…with only four.diversify it and you are good to go! Tags are not so much important anymore as is the actual structure of the page. Perfect SEO implements keyword phrase in Title, H1, H2, H3, and keyword density between 2-4%. Also on first and last sentence in post. Great blog! The Traffic Bandits would love you to read ..The Traffic Bandits Review is Almost Here! I agree that those on page factors are now more important than tags. The most important point I hope this post made is that you have to target one two to three word phrase using the factors you mention. If you see my related post on Keyword Usage you’ll see that I do mention those things, but probably not specifics on keyword density. First and last sentence is something I’ll have to remember to add to that post and recommend. That is very probable. First sentence definitely and closing sentence could be in the algorithm too. To further optimize our article in the eyes of search engines, how many keywords that must exist in our article? Each article should target one phrase but can target secondary phrases too. You may be asking about keyword density and that I am not expert enough to comment on. Look to SEOs and affiliate marketers for that information. I will see if I can find one willing to write a guest post on that topic. So basically having too many key words on our meta tags isn’t advisable,so why are there people out there still selling this ideas? SEOs and SEO tools suggest using way too many keywords because if they can convince the masses to target too many keywords they can easily outrank them. That makes it easier for them to rank their clients, earn their living, and look like SEO gurus. Never believe everything you read or hear! What they say and write in public is NOT what they share and do privately. I was under the impression that meta tags have been completely devalued? Or is that not correct? I.E. Google doesn’t look at them anymore. While G has an almost monopoly on traffic, they are not the only source of search traffic and others still use meta tags. There is so much disinformation about SEO that I would not dismiss meta tags. SEO plugins for WordPress all include them and if you look at high ranking sites you will often see they do too. You should be able to rank fairly well for location specific keyword phrases so I would use them. Even more importantly, I would definitely make sure I optimized my local search listings. See my Small Business Internet Marketing Starter Package for details. That’s really interesting about the %s search engines use to determine the importance of each word, i.e. 4 word title tag means 25% weight to each word. I think that tells you right there to keep your Title tags short and focus on one key term! About the keywords research it is often said that use that keyword which should be multi-word phrase and faces less competition and more returning. Yes, very true. I hope more people will listen to only those they can trust for advice. Many of the most prominent people writing about SEO spread disinformation to keep competition down. It is always best to use 1 or 2 words or phrases. And by the way Google complete ignores meta tags when ranking! Just saying. One reason many people think they should use all those keywords is because from the beginning their have been SEOs and SEO tools that recommended they use up to 100! keywords. I promise anyone reading this that the reason they do that is to keep you from being competitive! I say again: use ONE 2-3 word phrase the way I elaborate on in How to Select Keywords FIRST to make your content easy to find in search engines. How many keyword phrases (or words) can a site use in meta-tags without a Google penalty? I doubt there is any penalty…there is simply math. 100% always wins over 50% or 20% or 10%. If that isn’t clear to you yet you may want to re-read this post. It would be a very good idea for you to teach everyone who comments for buy tent the difference between spam and a real comment. HINT: this is a real comment. Anything generic is not. IMPORTANT: While asking questions you don’t really want answers to ARE real comments they are even worse than spam because they waste the businesses’ time answering them. PLEASE STOP DOING THAT! I have that domain blacklisted in all the blogs I manage and even wrote a post about Buy Tent Spam. If you see this and you would like me to edit that post and turn it into a success story for how to comment correctly that will benefit Buy Tent just contact me. It is not my intent to hurt any business; I just want to get their attention so they will stop damaging it themselves. Gail, good post. In terms of meta data, I’ve read that meta keywords are no longer read by search engines. Of course, these are different than WordPress tags which still seem to be useful. I find that meta descriptions are very useful still. Though WordPress tags are useful, many people have these turned off since they use All in one seo pack which provides this options in the no-index manager. I used to blog on WordPress.com and there are pros/cons of using the WordPress Tags. In some cases, I think that they link out to WordPress, so you might be losing PR. On the other hand, I agree that it does help you show up in their index for searches on Wp dot com. .-= Jay´s featured blog ..The Healthy Irishman – 5 great new recipes =-. Don’t believe everything you read. 😉 I know many SEOs who teach one thing and do another. It is much easier for them to rank their client’s sites if the masses believe that what works does not. As you explain, WordPress tags have pros and cons and that is true of most everything in life. I somewhat have ideas about it but you’ve explained it very well, specially the number of words in the keyword. .-= Jonas´s featured blog ..“Silver Surfers” Increase in Numbers Online =-. Even people who have been making a living online for many years are still confused about tag and keyword usage. Great article. I will definaty use this to the fullest. I read that meta tags dont even work. But if you ask me I think they still have some juice left in them. With out the meta tag, i dont think the site will get index very easy. It only takes a minute to type in a 2-3 word phrase and I personally believe they ARE still important but those who prefer to keep the little person from competiting effectively want you to believe they aren’t. I was really in search of this kind of blog and here my search ends as the information in the given post is the same that i am searching for.Thanks for sharing. Read my two posts that tell you how to use KeywordLuv and CommentLuv. Your article has opened my mindset about SEO, by the way I have already installed all in one SEO pack, but I dont have installed yet commentluv and keywordluv. Thanks to your article. .-= Golf Swing Trainer´s featured blog ..Golf Swing Instruction =-. Please visit our Golf Store and blog and become a regular commentator there. It is 100% DoFollow and has KeywordLuv and CommentLuv installed. If you have sites that are dofollow commentluv keywordluv sites leave the link in the comments of the keywordluv post so that I can add you to the exclusive blogs listed there. .-= George´s last blog ..The Turbo Traffic Systemn is live =-. Many try and say that these tags are no longer important since they are not as important as they once were. This is not really the case though since they are still part of the big picture. I do usually use look for commentluv and keywordluv What I didn’t do was post on social Networking sites and I don’t use bookmarking sites as often as I should. With your permission I am going to link to this article to my personal site :). I’m sure my friends will love this article. .-= Mario@halloween super affiliate´s last blog ..About Brian G Johnson =-. Sorry it took me so long to reply to your post. I work as fast as I can but can’t get to everything in a timely manner. Feel free to link to and use excerpts of anything in this blog. I wrote to assist as many individuals as I can. Have you applied to the gift affiliate program that Adam Riemer aka Rollerblader manages? We are always looking for serious affiliates. See the Holiday Promotions post and another since then on a Gift Card Giveaway for a small percentage of what we are working on. I think meta tags ,keyword tags are really necessary for a website as seo point of view.It comes in on page optimization. Only those who pay attention to the details achieve maximum success. SEO is a MAJOR detail. Bloggers and business owners must start realizing that simply having a Web site or blog is simply not enough. You must consistently promote it and make sure it is easy to find. More about that in my post about building traffic. .-= Gail @ Support Small Businesses´s last blog ..Social Media Marketing Monday – SMM Overview =-. I had heard that KW meta tags no longer mattered to Google whatsoever. Is that true? .-= Grant Hammond @ Nashville Realtors´s last blog ..Real Estate Tax Credit Causes Nashville Homes Sales to Soar =-. What they say and what is true is not always the same thing. I definitely recommend taking the time to add meta information because there is no way to know for sure and because other search engines definitely use that information. Bloggers can easily add SEO data these using either a theme like Thesis which we use or plugins including All-in-One-SEO or Platinum SEO. One other thing: have you listed your business in all the major free Local Search Directories? They are a definite benefit for making sure your business is easy to find, obtaining direct leads and getting incoming links from high PageRank sites such as Google Maps, Yahoo Local, Bing, Superpages and many more. Few people realize that even those who do not have the Internet are now using GPS devices, iPhones and cell phones that also pull business listings from these databases. You don’t want to ever lose a client because they couldn’t find your address or phone number and they found a competitor who was easy to find and made a strong pitch for their business. As expected, a Google search of ‘Deadhead Sinker Cypress’ shows your Good Millwork post in the number one position but I thought it interesting that the same image used, only on Flickr’s site, showed up as number three. On the post you used ‘Deadhead Sinker River Reclaimed Old Growth Virgin Cypress In Stock’ but that should have nothing to do with Flickr since you didn’t hotlink directly to that image. I see the correct key words added only not in the exact order or even together. Does keyword order make a huge difference? .-= Brian D. Hawkins@List Of My Blogging Friends´s last blog ..Are You A Blogging Friend To The Extreme Ezine? Get On The List! =-. That particular example would be too complicated to sort out because there are so many different names for the same thing. Most people are not going to string together Deadhead Sinker River Reclaimed Old Growth Virgin Cypress In Stock and many will only know that lumber by one of those myriad of names. They might search for deadhead cypress or deadhead cypress or sinker cypress or reclaimed cypress or virgin cypress or old growth cypress and so on and so on. If they do decide to use more than one descriptive word what order they will put them in is anyone’s guess. That is where keyword research can be somewhat helpful but when there are small numbers of searches one Internet user can greatly skew the results. Those who search using a search toolbar (and who doesn’t use a toolbar?) who repeatedly search for the same phrase instead of opening multiple tabs or using back to return to their original search make it APPEAR there are many more searches for one phrase than another when in reality they are all the same search done by one person repeatedly. Those who doubt this can prove it by doing keyword research. If you see a bunch of searches for a long phrase of many words logic tells you that one person did all those searches. The odds of more than one person using the exact same search (often with the same misspellings or choice of mixed case, lower case or upper case) are great compared to the likelihood that one person did the same search many times. This is a common ploy of poor quality SEO sellers: bragging about getting great position for phrases no one ever searches on or that include unusual words or a company name that is unique. No big trick to doing that and not very useful for generating traffic. Keyword order is generally considered important in that you want to use the most important word(s) first as much as possible in titles and other uses. Since these words are unique to that particular kind of wood it might be less challenging to rank for the words in various orders. If you were targeting a phrase that is high competition or has more than one commonly used ordering of the words involved you could tell by searching whether a specific search engine was displaying separate results for each phrase or the same results for all variations. If the search results are the same the phrases are considered the same by that search engine. If they are different they are not. This is why wise bloggers should write separate posts for variations of their most important keywords targeting different word order or phrasing. Thank you for including this blog in your list of friends. I don’t see you in our blog collaboration. Have I not invited you? One of the major benefits is we share what anchor text each blogger prefers and what page to land that anchor text on. Once I have that information I can more easily add links to existing related content on the blogs of our members. I didn’t realize that people were using search terms over and over to boost the number of search results. That’s pretty low life. I’m not sure what blog collaboration is. Are you referring to bloggerluv.com? I don’t think the searchers even know there are search results; they are simply doing what is easiest. If you plug a search into a search toolbar like the one built into FireFox it is easier to click search again than it is to back up and look at other results from the original search. Your last search stays in the box so why not just click search again? That is what most people are going to do and those who are doing keyword research need to realize that behavior seriously skews the numbers of searches. I emailed information on our private blogger forum to the email address you use when commenting. If you would prefer it resent to a different email address just let me know. BloggerLuv is one way to collaborate; private forums are another (and in some ways more powerful) and the method for syndicating unique versions of guest blog posts is a third. Let’s talk when you get a chance. Just wanted to say thanks for this extensive overview of the features. Man, you should really take money for your advice. 1) The search engines will know that the site linked to the words “Book Hotels Online” is about booking hotels online and rank it better. 2) My readers will know that site offers a way to book hotels online so if they ever do that they may go check it out or save your URL for when they next want to book a hotel. Read the post about How KeywordLuv works to better understand the benefits and to find other bloggers who have dofollow CommentLuv KeywordLuv enabled sites where you can comment. Yow! Didn’t know this about keywords. I typically put a bunch of keywords in, all the ones that are truly relevant to the post. Hmmm…I wonder if I should go back to old posts and remove the less important keywords. Unless you know that you have excellent placement in the search engines I would definitely reduce the SEO keywords to one key phrase. You can find out whether your site ranks for any of your keywords used in each or all posts by putting them into a free tool I explain in my post about Building Traffic. I would take the keywords you had in each page and plug them into that tool. If you aren’t on the first page for any of them deleting them will certainly not hurt and is highly likely to help. If you ARE on the first page for any of the phrases and the tool indicates your ranking is for THAT page be sure not to delete that phrase. Use the keyword research tools in that same post to see how many searches there are on each phrase. To decide which to use on each post or page select the one that has decent numbers of searches but is not super competitive. Use my contact form if you want insights into how to decide because that varies depending on what specific phrases you are targeting. Before you start read my post about Selecting Keywords as it will make it far clearer what the keywords for a specific post or page should be. I specialized exclusively in pay per click advertising for many years and have a lot of experience doing keyword research in multiple niches, some of them very competitive. I would be happy to answer any questions you may have and provide feedback on your choices. Just use the contact form here or email me from the information on that page. I just remembered I have a much better post that explains how to use Rank Checker and track your search engine positions. This tool is totally free and makes it really easy to keep track of how much progress you are having making your site visible to those who are using a search engine trying to find what you have. You’re very welcome. Thanks for reminding me! Your post on keyword tags is quite informative. Having read your post, I’m beginning to believe that I understand tagging. And yes, I do agree with you that marketing is important irrespective of good site or brilliant content. I am glad that this post has added to your understanding. It IS a very complicated subject because we are using multiple names for similar but different purposes. You might be happy to know that the link in your comment is currently the 13th most popular outgoing link from this blog so you should see visits originating here in your analytics. I hope you’ll read my post about marketing that I will use in CommentLuv in this reply. i really do appreciate the good work that you put in so thanks for the great blog. I have bookmarked it and will tweet about it shortly. Welcome Sam and thank you for sharing us with others. We recently wrote a post about where you can find us across Social Networks and in blog directories and online communities. I’ll share that as the CommentLuv featured post for this reply. Great post! As a writer, I struggle when clients want to target 10 or more keywords per page. This may have been the strategy in the past, but tactics have changed. A few per page is fine, yet many insist on targeting as many as possible. This also makes keeping copy to a minimum very difficult. I’m also amazed at how many keywords are not industry specific or highly targeted. It is always a challenge to guide people who may not be willing to listen or those who keep limiting their own success by insisting on what is not in their best interests. We must continually work to educate them on what works and what does not. Targeting general keywords doesn’t work. If you think writing is bad you should see some of the words businesses put in their pay per click accounts! I’m always amazed that anyone would actually think paying for traffic for the name of their state or colors or sizes without any other product descriptions could possibly work. I suspect many are trying to get their money’s worth when they pay for copywriting by wanting to target many phrases. What they don’t realize is that by doing that they may actually be reducing the benefits they get from their creative content. I know you know but I’ll say it here for those who don’t: the more high quality individual pages/posts you have that target the best keyword phrases for your business the more traffic you will receive from the search engines and the more leads and sales you will generate. Speaking of leads and sales, Conversion Rates are vastly more important than more traffic and usability and copywriting skills are key to increasing them. I am continually amazed that successful businesses and especially ecommerce stores are not more willing to spend more on improving their usability and copywriting. They are leaving a fortune on the table by being cheap. I see you are interested in Local Search so you might be interested in my post about how businesses can obtain their Free local search directory listings. Do read the post I’ll put in CommentLuv about KeywordLuv. It explains how you can turn your comments here and on other blogs in our DoFollow CommentLuv KeywordLuv Community into incoming links with your selected anchor text. How many times should I place my 2 word keyword phrase in my content? lets say my content is 800 words do I put it 2 or 3 times or more? or is there a percentage like 3% ? ; is keyword density important ? or is getting backlink more important? Also is there better backlinks than someothers ….I want to target sites and get backlinks that have the best link juice? or is it simply about more sites back linking to mine and it doesnt matter what sites I get back links from? Keyword density can be important but measuring it is not something I do regularly (although I have played with tools that do that for you – none I happen to have saved). If you were targeting pages to an extremely competitive industry like insurance or mortgages you might want to find out what specific percentages top SEOs recommend. Since I don’t write in any niches that tough I haven’t felt the need to do that. Backlinks are far more important and yes the quality is key. I don’t worry about link juice (and I should mention that I am not an SEO so they might be more concerned about this). I believe relevancy and quality of the linking site is more important that the page rank of a specific page. A link in the text of a blog post or the content text of a page on a static site on a page that is highly related to the page where your link is landing is the best possible link. I still believe that links from .edu and .gov sites are ranked higher than .com and links from other domain extensions even though some are claiming that is no longer true. 1) Create high quality content specifically about your target phrase which should be selected using this Anchor Text Selection process and use them as explained in this Keyword Usage process. 2) Obtain high quality incoming links from sites very relevant to yours from the page or pages on the other sites that are most related to the page on your site. It wouldn’t hurt to have links from a high PR page that is somewhat less relevant and one from the most related page/post that may not have any visible PR. 3) Comment in blogs usingKeywordLuv and CommentLuv, preferably dofollow blogs and ideally when the post you want to feature is still one of your last ten posts, and then share those posts on Social Networking and bookmarking sites. This can cause a huge jump in visitors and traffic as measured in my popular post about Commenting and Sharing Increasing traffic 54.87%. 4) You need your best content to be shared, reviewed and bookmarked, ideally by others but you can do some of that yourself. This is one of the reasons that I recommend being very active in the DoFollow CommentLuv KeywordLuv community. They are far more likely to understand how this all works and go out of their way to review, comment on, share and link to your content. They are also more likely to have powerful bookmarking or social networking accounts – powerful because many people respect them and will look at content they believe has enough quality that they want to share it. This is why those who are serious about making a better world in which more individuals can achieve success need to collaborate with each other. Any blogger interested in working together for the common good can Contact me to find out how we are enabling bloggers to spport each other’s efforts more effectively. I personally think the more keywords the merrier, just use it whenever you can but don’t force yourself and make your content look crappy with just keywords. That won’t be good. If you use too many keywords in your meta tags your pages will not get found for any of them. That is why understanding this is so very important. Your quote, “Marketing covers an enormous number of methods. No matter how beautiful a site or how brilliant the content if there is no marketing it will not be found.” is so very true. I work with many small business owners that spends thousands on beautiful sites but have no idea about links and anchor text. It ultimately is a waste of money since the site is never found. That has always been true since the beginning of the Internet and keywords word pretty much the same today as they did when I created my first site in the mid-1990s in FrontPage. Sadly, many Web developers only focus on what you can see and many Web site owners are most impressed by what they see and rarely willing to pay for what is even more important but not visible to the casual Internet user. Many bloggers are making the same mistake, churning out content without learning anything about how search works, where their traffic comes from, what converts (if they have monetized their site) or methods for attracting links and traffic. Another problem is that so many are allergic to anything they think of as sales or marketing – seeing them all as evil instead of using them for the greater good. That is the subject of the post I’ve featured in CommentLuv in this reply. I have the same question, if I target just one keyword phrase would I still be able to catch plurals, past tenses and such? I’m a little confused about this because based on my observation, sometimes it does, sometimes it doesn’t. Or are they doing something different about this? .-= Ben@Blue Laptops´s last blog ..Blue Laptop Skins =-. The reason it looks like sometimes it works and sometimes it doesn’t is because different phrases are less or more competitive than others OR sometimes variations return the same results because the search engines have equated the variations (consider the plural and singular or words with and without possessive apostrophes the same). It is challenging to figure out what the search engines are doing because of personal search which shows even the same person different results based on other recent searches so I rarely even bother. What I do is focus on my primary phrase, include as many variations as possible and then get incoming links for my select anchor text phrase or phrases to the pages that are most important to me. I am wondering then, if you are only selecting one keyword phrase per page, do you worry about the symantically related keyword phrases or do you think that it is best to stick to one and one only…I would like to hear your thoughts and any testing you have done regarding this. What I do is focus on one phrase that I use consistently throughout a post or page for SEO purposes and also use variations. The primary phrase is the most important one on that page but with any luck we can also be found for any similar phrases we use on the same page. They are likely to be less competitive and search engines do equate some words and phrases and automatically return them for searches. A good example of this used to be car and auto and automobile but I haven’t checked that in years so it could have changed. I wrote about that in the post about Selecting Keywords. I don’t remember if that post mentions rearranging words too. For example, you might be targeting Father’s Day Gifts but also use Fathers Day Gifts and Gifts for Father’s Day. The first two variations are likely to be equated in the search engines (return the same results with or without the apostrophe) but the second phrase might return different results. You never really know unless you do the searches on at least the major search engines. I personally feel that tagging contributes only when you have solid content on the page. The tags should be just oriented with the content. I remember reading somewhere that the meta tags are no more efficient and are treated with less importance by search engines. I guess the only place where its prominence is considered is with ppc campaigns, where you have lots of third party content oriented websites inclusions. .-= Craig@Car Rental Auckland´s last blog ..Rugby World Cup Car Rentals =-. Obviously both keywords and tags must apply to the specific content. The key takeaway in this post is that all keywords are not used for the same purpose and to maximize effectiveness we must know what the purpose is and select how many keyword phrases to use accordingly. .-= Gail @ Support Small Businesses´s last blog ..Why We No Longer Recommend Yelp to Businesses =-. Debate about meta tags has been going on for years and will probably continue for a good many more – but there are more important things to focus on, like the creation of content or link building. Meta descriptions are most useful for writing something compelling enough for people to click your listing. It isn’t a debate. For maximum success bloggers and Web site creators need to use both properly and the first step to being able to do that is to understand how they’re different. Obviously you have to have content first but if you don’t use tags and keywords, attract or solicit links, and generate traffic somehow it won’t matter if you have the most brilliant content ever created because no one will see it. People have got to quit assuming that if they have great content or a beautiful site that someone will link to them and send them traffic. Even bloggers like me who randomly link to quality content have to be able to find it in the first place before we can link to it. After I thought about this for a while I agree that is another good way to look at this. You’re right. Great post! I am so sending this to one of my “baby” blogger clients for her use. This is probably one of the easiest to understand “descriptions” I’ve found to date. .-= Michelle Mangen´s last blog ..How to Move Data in One Row in Excel to One Column =-. Good to hear from you Michelle. I, too, know that we sometimes have to neglect one area to focus on something of a higher priority. Wait until you see the blog syndication system I’m working on. It will make a HUGE difference for all interested in using it. Gail – oh you are teasing me! I can’t wait to see what you are up to! I actually did a few posts this weekend to go out this week. Have you tried/heard of Scribe’s SEO plug-in? I got it about two months ago and I just now started using it tonight. It’s a good reminder to do what I should be doing and was excited that on my third post I actually got a 100% score from them. .-= Michelle Mangen @ Your Virtual Assistant´s last blog ..Social Media: Relationships and Burgers =-. I’m primarily working on the unique blog post syndication idea. I have heard of Scribe’s SEO plugin but have not used it yet. When it is “hard to pick” that is an indication that you want to write multiple pages/posts – one targeting each phrase. This is a good explanation of the difference between keywords and tags. I think most people probably use both to liberally. I do believe that it is important to have about 3 key phrases for each article (not just one) that you want to target on a page that are all related and in order of importance…this will bring more traffic over time. .-= Richard@How To Videos´s last blog ..How To Make Money On Amazon With the Amazon Affiliate Program =-. While a page, post or article can and does target multiple phrases and variations of the words, for the purpose of the SEO fields, the name of the post, and other places where keywords should be used it is best to decide on your highest priority phrase and target it. That post explains how you can also use other variations (singular/plural, inflected forms, past/present, synonyms) so your page is more likely to be found for the maximum number of searches. I believe tags are most important than categories because categories “in most cases” are a very wide topic. Categories such as “computers” or “desktops” may be such a huge topic that it would be very difficult to rank higher on search engines. Whereas, tags can be anything. For eg., “red desktops”, “desktops for kids” or anything of that sort. Ranking higher on search engines for such tags is much easier as compared to those heavy categories. Secondly, it hardly takes any time to setup tags before you start writing a post. Spending those 5 minutes before you start writing your article can be extremely helpful. Setting up tags in beginning will also help you focus on some of the best keywords you will be using in your article(s). Over all, wordpress tags are extremely helpful in ranking higher for relative keywords and/or phrases. .-= Andy @ Top Ten Reviews´s last blog ..Best Shared Web Hosting 2010 =-. Yes, that is true. I covered more about that in the two other posts I added to the bottom of this post. Yes you are absolutely correct. Only those who realize that success is not either/or it is doing a hundred things that seem small but add up to make a huge difference. Most businesses including blogs are built one subscriber or buyer at a time found gradually over months and years. Everyone wants instant growth when they need to focus on long term results. I like your site and especially the pop-ups that explain things like core charges. You may want to use the list in the KeywordLuv post to visit the other dofollow CommentLuv KeywordLuv blogs listed there. I agree that targeting one 1-3 word phrase per page is best for getting each page found. I would insist not to target more then 1-3 keywords per page as it may confuse the search engine regarding the page relevancy and thus may face difficulty to rank…. Wow, that was a quality post. In theory I would like to write like this too. You need time to create that interesting and additionally real effort to make such a excellent article. I’m not sure I would recommend my type of blog posts to most bloggers. They take so long to research and link that many other posts could be written and published in the same amount of time which is usually better for generating traffic and better search engine positions. The reason my posts are so comprehensive is that I use them to record and share the results of my research. I refer to them myself when I need the information again and share them with others. My special calling is to figure out how something works and then explain so that anyone can understand even if they have no prior background or experience. There are far easier ways to write. Thanks for the great contribution. Read your blog regularly and I like your posts. If you ever have questions or need assistance finding something just ask by commenting in any post or using the contact tab at the top of the blog. I am one of those people that believes in lots of tags and categories, when the type of site warrants it. It’s not about SEO, it’s all about helping visitors find precisely what they want or need once they hit your site. .-= app103´s last blog ..Free Music Download: New Century Classics – Natural Process =-. Thanks for sharing these links April. I should have known you would be one of the bloggers who had already implemented the ability to subscribe to sections within a blog. I’ve been talking to Phil about using FeedBlitz (a simply awesome alternative to FeedBurner to do that very thing. I believe FeedBlitz is the next great solution for bloggers and really should have installed it and written up how-tos on it by now. It looks like it can replace both FeedBurner and AWeber or whatever other mailing list and autoresponder solution a blogger is using. Your sites are like mine: intended to be reference resources and like me you know that having what your readers might be interested in visible on the page is the best option. If anyone is interested in programming I recommend you connect with April on Twitter, FriendFeed, through her sites and at Donation Coder. There is a forum there and programmers who write custom code on request. When you use WordPress, like you do, it’s easy to add plugins to do everything you want and need. People that figure out how to do things can package it up to make it nice and easy. When you use Blogger, like I do, you have to roll up your sleeves and get your hands dirty, directly editing your template to accomplish anything. I feel that those that have done it successfully have a duty to the blogging world to publish easy to follow instructions for the rest of us. .-= app103´s last blog ..Free Bird Icons (CC-BY) =-. I sincerely wish there were more people like you April and that is exactly why I write step-by-step how-to posts. Most bloggers write about advanced skills for others who already know what they’re doing and even then don’t include the basics. Few who have figured out how to do something ever bother to share what they have learned with all the others who need that information. There is a great need for easy to understand how-to posts and they are popular for bringing in traffic so I encourage more bloggers to share what they know. I don’t enjoy playing with code or layouts or design. I am purely a wordsmith and teacher and am SO grateful to have the WordPress Ninja Derek Semmler handling all the technical details including installing and updating plugins for me. Many bloggers are not going to be technically inclined or to enjoy doing these things even in WordPress or the Thesis Theme. I encourage them to collaborate with others who love and have aptitudes for what they do not know how to do. We are all more productive when we focus on what we are best at and love and work with others who do what THEY are best at and love. Thank you for this clear explanation of tagging on WordPress. I’ve recently opened up a couple of blogs using WordPress so I’m still trying to get to grips with it. This will definitely help me in terms of SEO when I’m planning new content. .-= Jake Rhodes@ Hypnosis´s last blog ..Ask the Hypnotherapist #19 =-. Two other posts that will help you are on Selecting Keywords first so your content is easy to find and on how to determine what your best keywords and anchor text are. Those posts include how to research your keywords using free tools and how to track your results. Making or choosing tags, meta tags, keyword tags is a tricky thing when it comes to SEO. I think the best way to do it is to just concentrate on 1 keyword and focus on the content of the article with the targeted keyword on it. .-= Teena@V8 Supercars´s last blog ..Eco Tour, Full Moon 9km Bushwalk and Photography Class – Royal National Park, Sydney =-. Your comment reminds me that I should add two more links to the resources at the bottom of this post on Selecting Keywords first so your content is easy to find and on how to determine what your best keywords and anchor text are. I like the way you clearly explained tags versus keywords. Maybe because of my technical writing background it wasn’t difficult for me to understand this concept. The only place i got a little confused in this post is when you started talking about WordPress.com. I think this was an odd digression. I still struggle with the categories, but only from the standpoint of how many is too many. While I like the fact that you have a lot, sometimes I’m just not sure where you would place a post. Everyone thinks differently, but as long as you have a good search function then for me it doesn’t matter. This subject is REALLY confusing to many people and one of the things I get asked repeatedly by the same person far more than any other. That this is obvious to you is a real advantage for you and those who select you as their freelance writer. The reason I mentioned WordPress.com is that many people believe their posts are showing up there when they can’t. Even I wasn’t sure there was no way to get them to be visible there until I researched this post. It isn’t always clear even to the blogger what their major categories are going to be at first. I could probably clean mine up a little so there would be fewer places to look. The drawback to using search over categories is when it returns too many results which is going to be more of any issue the longer a blog is online and the more prolific the writer is. In your case you can always just ask me on chat and I’ll tell you where the post is you’re seeking. That is also why I created a Best of GrowMap page. If you ever see that a post you want to revisit is not on that page let me know and I’ll add it. This post has got me thinking. I don’t normally think about how many categories someone has on their blog. But I guess it depends on what I’m researching. I tend to use limited categories. But looking at your categories it helps to have them listed out. It really highlights how much information you really are providing on this blog. I can see your point. Something to think about thanks for this post. .-= Jonathan @Get Traffic to Your Website´s last blog ..How to Get Traffic to Your Website =-. Thank you for taking the time to comment. I agree that it depends on the type of blog you have and its purpose. There are other methods that would work but are not as obvious. Since I intentionally reach out to those who are very new I want to make these categories visible on the page. On your site the navigation tabs with drop-downs can serve the same purpose as long as your readers realize they are there and point at them. What percentage of visitors would never find them could only be known by doing usability testing. I have found something VERY important that you will want to know about now rather than waiting for me to get the blog posts written. I was going to send you an email but don’t see a contact form or address on your site. Please contact me ayc. I DMed you my email address at Twitter or you can use the contact form here. Hi Gail I love the way you structure your categories, it does make it easy for users to find exactly what they are looking for. I don’t see many people doing this. So if we listen to the advice of build your site for the user then this would be a clear example on how to do that. Also I notice you use topics instead of category is there any reason or just preference in labeling it that? .-= Danny @ Florida Vacation Rentals´s last blog ..Davenport Vacation Pool Home =-. It is good to know that some find the categories useful. I suspect that few bloggers see a blog as a reference resource. Some of the very best bloggers have exceptional content but it is nearly impossible to find on their sites – especially when they write about something frequently and their site search doesn’t return the posts in chronological order. Search is something else that is essential for EVERY site and blog but I have actually had people argue that they don’t want their visitors to be able to find what the visitor wants because they want to control where they go on the site in what order. Are you thinking of this blog or one of our others? The heading I see in this blog is categories so if you see topics I need to figure out why. The industry I am in probably has 20 different sayings for the service I provide. A bounce house can be called an inflatable, moonwalk, jumper, jumpy thing as so on. It’s hard to do SEO for all these keywords. That’s why I decided to focus just on bounce house and dominate that keyword. Once my national site is big I’m hoping we can get the majority of people to call it one thing… bounce house. Bouncehouse and moonwalk are probably your best keywords because inflatable, jumper or jumpy thing would pull up far too many unrelated sites. What you can do is make sure you include those words on your site. I see you’ve already done that. I also see you have the names of locations around you covered too and you have photos of what you offer plus reviews from those who have rented from you in the past. Good job. I would definitely make sure you have your Local Search Directory Listings on at least the major sites and encourage your customers to write reviews for you on them. The Support Small Businesses post contains links and information you can share with customers on how to write reviews on many of the most important sites. Anyone is welcome to reblog that information or share it on their own site. Another excellent strategy is to get active in communities where other businesses where you are have listings. Create a profile with an Avatar and links to your business first. Then write reviews for your favorite restaurants, service providers, and any business that is likely to appeal to the same customer base you do like toy stores, children’s clothing stores, etc. Businesses that take the time to leave honest, detailed reviews for other businesses benefit two ways. First their reviews are a path to their own listings and second those other businesses – if they know or have used your services – are likelier to write a review for you. Thanks! After every rental we send out an email thanking the customer for our service and there are links to review sites and our Facebook page. We did have one from Yelp, but after reading your post and finding out that the 2 reviews I had were deleted, I’m not promoting their site anymore. That sounds like the best plan because there are more comments indicating that valid positive reviews written by regular customers for businesses at Yelp have disappeared. It will be best to recommend your customers write reviews on sites where they are far more likely to stay than waste their time and have their kindness deleted. We do always have to read the TOS (Terms of Service) on sites that accept reviews. Some of them prohibit any actions to incent people to write reviews for you but one would hope suggesting it and offering a link would not be an issue. .-= Gail @ Support Small Businesses´s last blog ..Keyword Tags, MetaTags, Tags: How Many Are Best? =-. Hi. Admittedly, I am in Australia and things might be different there but, I have never heard the phrase ‘bounce house’. We would usually call it a Jumping Castle or Inflatable Jumping Castle. I know what you mean though. I want to rate well for ‘plantar fasciitis’ but some people call it heel pain, heel spurs, policeman’s heel etc, etc, etc…… I’ll be interested to see how you go. Please keep us updated. .-= KS Chen @ Google Adsense Tips´s last blog ..Increase Adsense Revenue with New Feature =-. I encourage everyone not to dismiss simple methods that are important and there is little more important than understanding anchor text and keywords. I once had a blogger say they didn’t care about incoming links they just wanted more traffic. What each site owner must understand is that choice of keywords, incoming links and search engine position ARE the major reasons for receiving more traffic. Yes you must have quality content and that must include everything a business offers and specifics about your services if you offer those. Only words that appear on your site can be found so anything you don’t specifically have in text is never going to bring you visitors. Marketing covers an enormous number of methods. No matter how beautiful a site or how brilliant the content if there is no marketing it will not be found. Marketing is important, its build traffic then great content maintains it. Building links is no 1 key to boosting a site search engine ranking, and thus your traffic! Link building through marketing really does work well if you understand what marketing content really means. .-= Hafsoh @ UK Business forum´s last blog ..Dell shows off several mobile stunners – Inquirer — Date Posted: 22nd April 2010 13: =-.